The United Kingdom has a strong reputation as an entrepreneurial nation. Recent Financial Times rankings have shown that globally, MBA graduates with UK citizenship are the most entrepreneurial with 35% going on to set up their own companies. The UK ranks eighth out of 137 countries in the Global Entrepreneurship Index, and Tech City reports in 2016 and 2017 showed London to be the leading digital hub in Europe. Startup culture and entrepreneurship are richly embedded across the country. In July this year, Instant Offices analyzed data from Companies House and compared it against population estimates and business growth to determine which UK cities are the most entrepreneurial. For budding entrepreneurs considering business school in the UK, London seems an obvious choice. But, in 12th, London is a surprise omission from Instant Offices’ top 10. 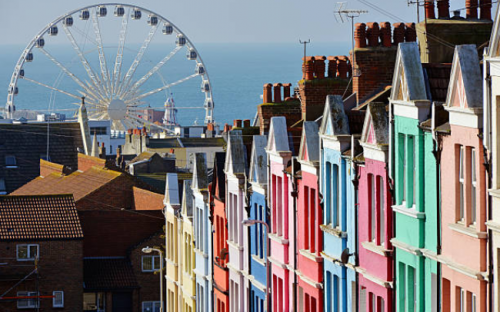 Brighton has clinched top stop, with its strong creative industry. There’s definitely something in the air and the University of Brighton MBA program is an enticing proposition for those looking to start their own business in a more relaxed atmosphere then some of the other metropolitan hubs in the UK. Manchester has a rich history in music and sport. In recent years, it’s been part of the Northern Powerhouse proposal to boost economic growth and reposition the British economy away from London and the South East. With the establishment of MediaCityUK as well as Rise Manchester which hosts startups in the FinTech area, this is an exciting time to be part of the city. Nottingham is a student hub with two local universities and one of the youngest populations in the UK, with more than half of its residents being under 30. It was named as one of the UK’s six Science Cities, which recognizes Nottingham as a hotbed of international science and technology innovation in both research and business. Nottingham Trent University was ranked as the UK’s most sustainable university in the People & Planet University League and offers both full-time and Online MBA options with a special focus on sustainability. This year’s Leicester Startup Weekend, held at the start of February, was the largest ever demonstrating the growth of entrepreneurial spirt in the city. There’s also an active entrepreneurial community with the Leicester Tech Startups group, founded by entrepreneurs for entrepreneurs, actively encourages networking events in the city. Newcastle is a city actively promoting entrepreneurial pursuits with the North East Growth Hub offering finance and business support for growing local business while The Newcastle Startup Week + Newcastle Scaleup Summit launched in May 2017 to inspire and encourage more of those in the city to start and grow their own businesses. Newcastle University Business School offers a full-time, customizable MBA and is involved with the North East program designed to help local businesses. The number of new businesses in Coventry grew by nearly 12% in the past year and the city is home to the Coventry & Warwickshirt Growth Hub, part of the government supported grow hub network designed to help start-up with advice and business expertise. Coventry University offers a wide range of MBA programs both based in the Coventry as well as on campus in London to give students an in-depth exposure to the business world. Historically home to the UK’s automotive industry, Birmingham has now embraced startup culture and innovation. With entrepreneurial networks such as Silicon Canal encouraging the city’s tech ecosystem and with new infrastructure developments such as HS2, the work environment in Birmingham is reshaping rapidly. The University of Birmingham is also innovating and offers the world’s first 100%-online MBA to be accredited by AMBA. While Aston Business School, also based in Birmingham, offers a full-time one-year program with global exposure and 90% international students. Bristol, and its close neighbor Bath, are home to a tech and digital startup boom. Home to the Silicon Gorge startup pitching competition and with a history of aerospace and microchip design this area is increasingly attracting investors. The Bristol startup, GraphCore, recently raised an additional $30m for its AI chip. The University of the West of England offers a one-year full-time MBA based in Bristol. The nearby Bath School of Management offers an MBA ranked among the top 60 programs in the world by the Economist. Cardiff is reinventing itself from its history built on coal towards innovation and entrepreneurship. With the Welsh Government’s commitment to the Superfast initiative to provide high-speed broadband across all of Wales as well as a world class metro system planned for Cardiff, it’s no wonder companies such as PayPal are opening centers here. Cardiff University Business School offers a full-time MBA in the city that gives real world insight into business practice. The Open Data Institute has ranked Edinburgh second, only to London, in terms of innovation in the UK. Last year, the city was awarded the Entrepreneurial City of the year Award and it’s the UK’s second-largest financial center. The full-time University of Edinburgh Business School MBA ranked 14th in the 2017 FT Global MBA rankings for career progress. One-Year MBA Vs. Two-Year MBA: Which Should You Choose?